2016-17 editor Dana Branham with The Daily’s newspaper Pacemaker award. 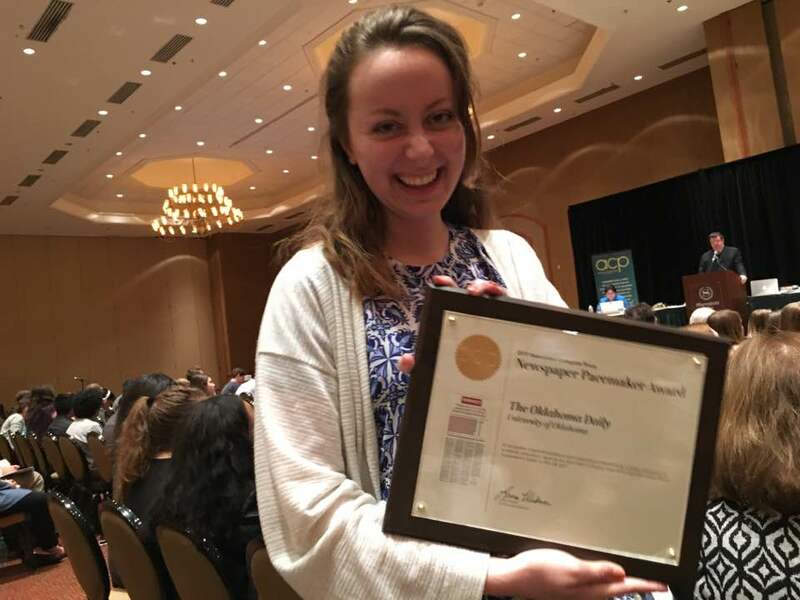 The OU Daily returned from the College Media Association/Associated Collegiate Press national convention in Dallas in late October with a slew of honors, including a Pinnacle award for Best College News Outlet and a newspaper Pacemaker. The period judged was the 2016-17 academic year, which spanned Dana Branham‘s time as Daily editor-in-chief. The Pacemaker, which has been called the Pulitzer Prize of collegiate journalism, is awarded annually by the ACP. In addition to demonstrating excellence in key areas including coverage, writing, editing, design and photography, the winning newspapers took risks and served as a strong voice for its student audience. In addition, The Daily won fourth place in ACP’s multimedia story of the year category for Waiting Game, a project written by Emma Keith, shot primarily by Bryce McElhaney, edited by Jesse Pound and designed by Branham. Sooner yearbook was a Pacemaker finalist for its 2015-16 edition, edited by Rachel Campbell. Finally, digital/design adviser Seth Prince was presented an honor roll 4-year newspaper adviser award.